Hu Kai Wen inks are the most famous quality inks in China but historically the brand name was not controlled so many copies and fakes appeared on the markets. Here we explain the history of the Old Hu Kai Wen workshop and their Li Ting Gui inksticks. See also the Buyer’s Guide to over 80 varieties of ink from Old Hu Kai Wen, inkston introduction to chinese ink and some dramatic pictures from the Old Hu Kai Wen workshop. Hu Tian Zhu started as an apprentice ink craftsman, married the master’s daughter and opened his own business in 1765. He chose the name “Hu Kai Wen” from his own surname “Hu” and the chinese characters 开文 KaiWen which means enlightenment: the characters were taken from a sign on the Confucius temple in old Huizhou (now called SheXian) which read ‘天开文苑’ (in traditional chinese right-to-left 苑文開天). This simple but sophisticated Chinese phrase means the universe enlightens people. Another literal translation could as Heaven Opens the Literary World, since 文 Wen means both culture and writing or script. So similarly Hu Kai Wen can also mean “Hu opens culture” as is quite appropriate for the inkstick workshop. Hu Tian Zhu was a perfectionist and set up very strict principles on raw materials selection, inkstick design, and production process in order to produce the highest quality inksticks. Hu Kai Wen quickly became the most prestigious supplier in China. As demand grew, the Hu family opened up many additional Hu Kai Wen branches. However 150 years later by the end of the Qing Dynasty, many branches had rented out or sold the Hu Kai Wen brand, resulting in numerous Hu Kai Wen and similar shops Hu Kai Ming, Hu Xue Wen, Hu Cui Wen, Hu Zheng Wen, etc. None of these shops actually sold the authentic Hu Kai Wen inksticks anymore. Then, after the introduction of Western inks, China’s ink industry started to collapse and by the early 20th century, only four Chinese inkstick workshops survived and ink production was only 2.5 tons per year. By the establishment of the People’s Republic of China, the whole country was left with only 23 inkstick craftsmen and less than 2 tons annual production. In 1956, the central government of China decided to rebuild the industry. The four surviving inkstick workshops were merged by the Chinese government to form a state-owned inkstick company called She County Ink Workshop. With the financial help from government, production of different traditional inks was restarted (1964 oil soot, 1973 turpentine soot) and in 1981, the very first Chinese inkstick laboratory was established under the help of Chinese government. In 1982, the She County Ink Workshop changed its name to She County Old Hu Kai Wen Inkstick Workshop. The Old Hu Kai Wen workshop is also the only Chinese inkstick workshop awarded China Time-honored Brand (中华老字号) status by the Chinese Ministry of Commerce. Old Hu Kai Wen is also recognised by China Central Government as an Intangible Cultural Heritage of China. The packaging and the calligraphy decorations are written in traditional Chinese characters rather than modern simplified characters. You might also see the Old Hu Kai Wen seal stamp – can you recognise the characters in the red box in the picture below? It’s the same traditional characters for Old Hu Kai Wen 老胡開文 but written in 篆書 zhuànshū Seal Script. Li Ting Gui is the most famous ancient inkstick from old Huizhou, the same place as the Hu Kai Wen workshop, who continue producing Li Ting Gui inks today, so in 1962, the Old Hu Kai Wen workshop registered Li Ting Gui 李廷珪牌 as an officially registered brand name for their inksticks. Li Ting Gui lived in Five Dynasties and Ten Kingdoms period of 10th century China and died in 967. 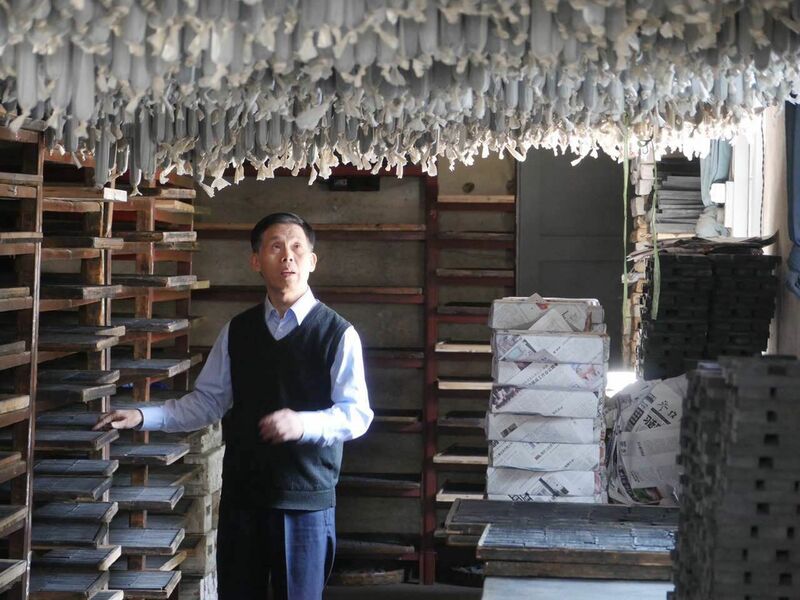 He was born in North of China and started making inksticks in the family business from a young age. However, to escape wars in the North of China the family moved and finally settled in Anhui in SheXian (old Huizhou). It is said that the family decided to stop at She Xian is because of the ready supply of the best raw materials such as pine trees. 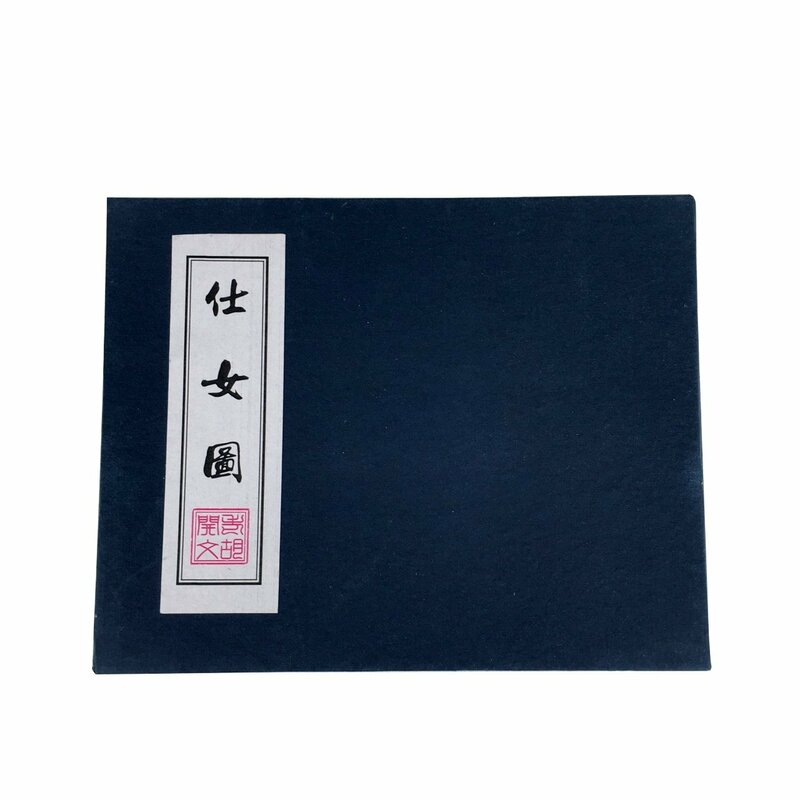 Li Yu, the Southern Tang ruler still famous today as a poet and calligrapher, was so impressed with the inksticks that he awarded Ting Gui the royal family name, Li, for his contribution in making fine Chinese inksticks. 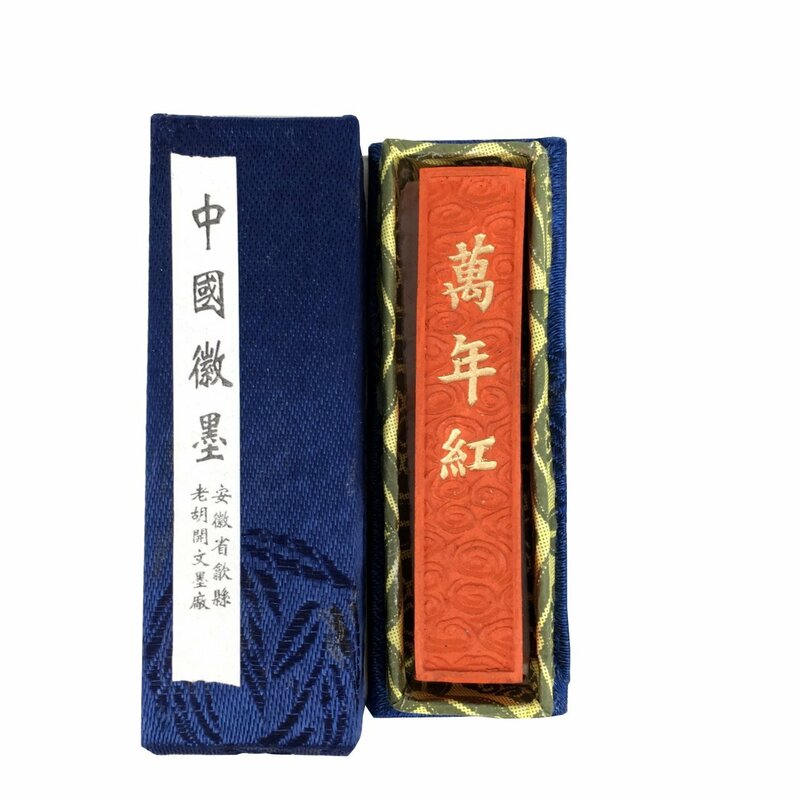 Since then, his name was changed from his birth name Xi Ting Gui to Li Ting Gui [in China surnames are used as the first part of the name] and the famous Li Ting Gui inkstick continues to be made today in the traditional recipe. The ancient description of the Li Ting Gui Inkstick has long been regarded as the most strict guide to create a quality inkstick. Li Ting Gui inkstick was once described as ‘ 廷之墨，松烟一斤之中，用珍珠三两，玉屑龙脑各一两，同时和以生漆捣十万杵”。因此，“得其墨者而藏者不下五六十年，胶败而墨调。其坚如玉，其纹如犀”。Translated into modern language, these ancient Chinese words mean, “each Li Ting Gui inkstick needs 500 grams pine soot, 30 grams pearls, 100 grams jade, and 100 grams borneol. After being mixed up with turpentine, all these materials need to be crushed for over 100,000 times. Therefore, even after 50 or 60 years, the Li Ting Gui inkstick is still fresh. The inkstick has very low resin percentage and this makes the ink very thick and deep coloured. The inkstick is as hard as jade, the ink is still wonderful”. Read more about the history of inkstick recipes. In 975 the Southern Tang were defeated by the Song dynasty, however the famous inksticks continued and from 976 the entire production of Li Ting Gui inksticks was reserved for the Song imperial family. It is recorded that the few examples that found their way to market became more expensive and harder to get than gold during Xuan He period (1119 – 1125) of Song Dynasty. In Qing Dynasty, Qian Long Emperor ( 1736 – 1795) collected a Li Ting Gui’s inkstick called 翰林风月 Han Lin Feng Yue which is now in the collection of National Palace Museum of Taipei. Over 80 handmade Hui inksticks, special mixes for different painting effects, professional, historic & collectible designs from Old Hu Kai Wen in Anhui. The premium ink range includes the finest inks of the different types, many made with precious ingredients and famous recipes. 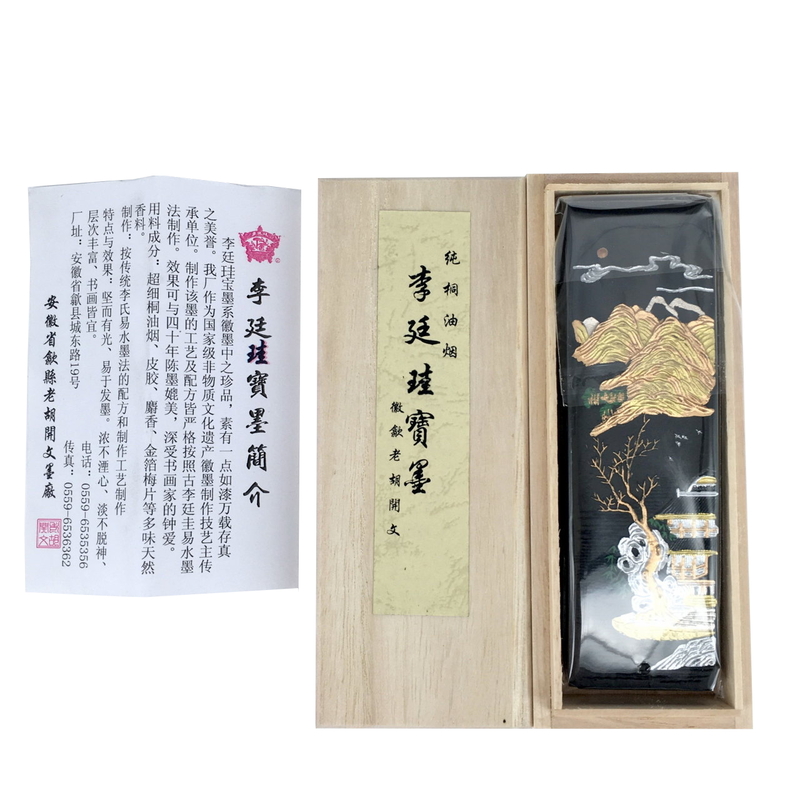 松烟 (Song Yan) Pine Soot is a very ancient type of carbon black inkstick with very rich natural matt dark colour, preferred for painting, both for to express depth and space in Shanshui landscape painting and detail such as hairs on portrait paintings. Pine soot is also used to mimic ancient calligraphy styles. Glossy blacks were invented in Song dynasty by adding Turpentine, and later by using Tung oil. Tung and Turpentine inksticks are very black, glossy, and long-lasting and most suitable for painting. 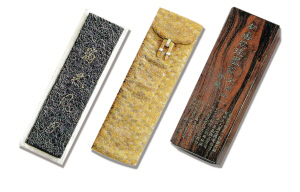 仿古墨 Fanggu Mo sets of inksticks with traditional decoration. Sets of natural stone colours and individual stick of precious colours such as Cinnabar and Pearl.